If you like simple match 3 games, then try Jewel Puzzle Click game. 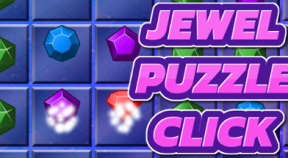 It is a game that you just need to find jewels of the same type that are close to each other and click on them to make them disappear and earn points. It is a very simple game with easy achievements to be completed.